We are only three months away from the 100th anniversary of the appearance of Russia's Romanov Tercentenary stamps. They are always popular and will be more so in the coming months. But how much are they worth? So the range is from 14 at the bottom to 60 at the top, with an average of 41.5 euro. Personally, the values I sometimes can't find for set making are the 2 and 3 roubles. The 1 rouble is very common and the 5 rouble is not hard to find. I ask about £20 (25 euro) for a used Set with nice postmarks. The chalky paper used for the kopeck value Romanovs does mean that a lot of those stamps have unattractive smudged cancels which I would not include in a Set. Mint stamps are more complicated. 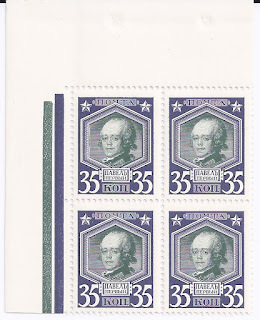 For a few values there do seem to be remainder stocks available, even today, so that is is possible to get ** stamps and blocks 4. But to make a Set which is ** is extremely hard. For some values, most collectors will have to accept * stamps. In addition, many stamps now suffer from gum toning. All the catalogues except Gibbons make the 2 rouble the scarcest stamp. Gibbons price the 5 rouble highest but here I think Gibbons is wrong, even allowing for "extra" interest in Nicholas II. The 1,2 and 3 rouble stamps are all harder to find * or ** and different collectors and dealers will have different ideas on what is the scarcest - quite often, I am told the 1 rouble * or ** is hardest to find. Soloviev 60 roubles (about 1.5€) for * and 150 roubles (about 3.75 €) for ** with 700 roubles (17.5 €) for a ** Block 4.